What happened to saddle pads? A sheepskin half pad can provide extra protection to your horse’s back. 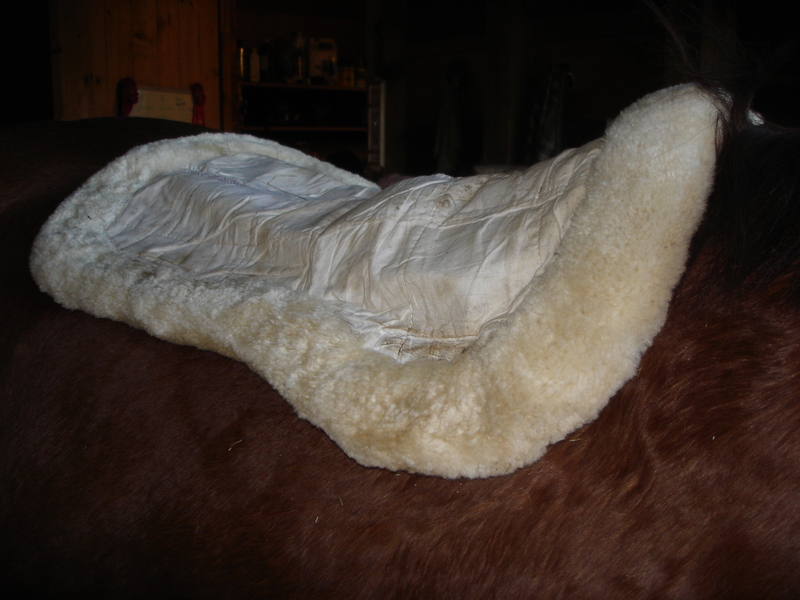 Sheepskin is also a great choice because it also wicks moisture away and keeps your horse more comfortable. Back in “the old days” saddle pads were used to keep your saddle clean when you rode. As I recall, there wasn’t much choice beyond the traditional fitted pad. Probably the most you could spend was $30. Now, the choice of pads is extensive — baby pads, fitted pads, correction pads, therapeutic pads, square pads — it can make your mind spin. And empty your wallet just as fast. These days, you can spend more on a saddle pad than I paid for my first saddle! In many regards saddle pads have improved. You can now buy pads with pockets for shims that allow you to adjust saddle fit. I’ve used my Mattes correction pad on many horse and saddle combinations, and they are very useful. I chose the quilted version. It’s not as expensive as the fleece versions, doesn’t add as much bulk, and it’s easier to wash than the versions with fleece. You can buy pads that help wick away moisture, keeping your horse’s back cooler. I use natural sheepskin pads for my daily pad for that reason — plus offer a bit of cushioning without changing saddle fit. I also have a Dixie Midnight pad, which is an anti-sweat, venting pad, that I use in the summer. We’ve moved beyond the bulky gel pads that were supposed to cushion saddles, to highly advanced materials that absorb shock without bulk and with no compression over time. I’ve owned most of them – from Saddleright pads to Thinline. I love the fact that you can add a bit of cushion without changing your saddle fit. I use an ultra thin pad under my fitted pad when I hunt. It adds no bulk and I believe it helps reduce concussion. And then there are baby pads, which people seem to use to keep other pads clean. I’ve never bothered with those. I don’t need any more laundry! I still strongly believe that your saddle should fit without a lot of bells and whistles. But it’s nice to have a few when you need them. Are you a saddle pad addict? What pads do you have in your tack room? I have two go-to pads: Mattes correction, and a custom Skito western pad. Hudson prefers the cushion and extra weight distributin of the western pad. I use it for trails and for “dinking” around riding. It does change my leg position, so back to the Mattes when we’re doing ‘real’ work. As for regular dressage pads, they can be old and ratty as long as they are thick and cut for high withers!